Provides professional indoor environmental services testing & investigating air & water quality to improve health & hygiene of homes,offices,buildings, & healthcare facilities. 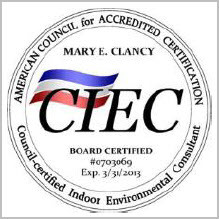 President Mary Clancy RN, CIEC, CMRS, HHS, is a Registered Nurse, a Certified Indoor Environmental Consultant, Certified Microbial Remediation Supervisor, & a Healthy Homes Specialist. In 2009 she became certified as a Level I Thermographer through the ITC. 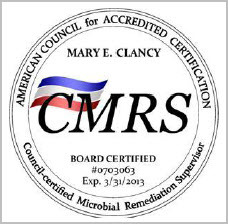 Ms. Clancy has more than 40 years of experience in healthcare, building hygiene, environmental infection control, and contaminate testing & removal. Secure Environmental LLC serves the Northern Virginia, Maryland, & Washington DC communities. Our office is located in Leesburg,Virginia.